I disagree. Proton quality is very good. Another fake news. Everyone knows this Perodua Bezza is a Game Changer, cheap service and best quality. Persona in the other hand, is clearly a Game Over car, even the sales report also Game Over already. Proven already so Habisla Persona!! Another cheap fake new by persona owner. P2 scared because their services actually higher than P1. Not to mention their SA will include Pro-Care on every services unless you opt out. This is not the correct practices. Good job paultan to make a detail comparison. This info should alert new car buyer that P2 is no more cheap to maintain like last time. Ha ha ha. 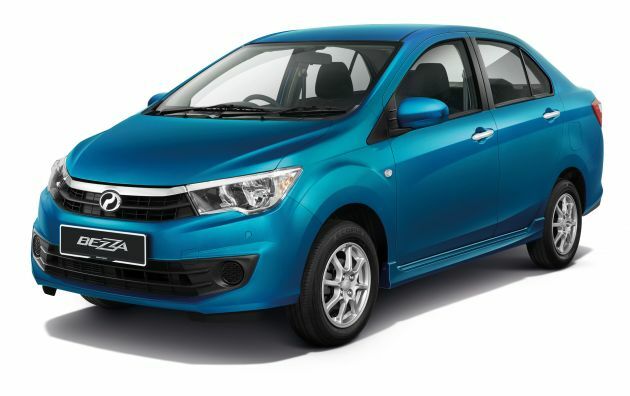 Perodua has given it to Proton and has proven that Proton plays dirty. Dude, did you not read the article? The Bezza is still more expensive to maintain than the Perodua even after taking out all optional maintenance packages. A cheaper and smaller car more expensive to maintain. Looks like Perodua afraid of public perception that their cars are overpriced to own and maintain. P2 sales of Myvi since its launch in November already 110,000 cars. This joining the 1.1 million happy Myvi customers on the road. P1 sales of Iriz since its launch in this month and soon will increase up to 110,000 cars in the future. This joining the 1.1 million happy Irizcustomers on the road. Thanks Paultan! Otherwise typical Perodua Service Centre just advising to do the optional services buta2. Saying that they are standard services. Utk yg dompet nipis mmg berkira, yg tebal ikutkan aje la. Huhu. No engine oil viscosity doesn’t change the price of the engine oil unless its the type of the engine oil eg mineral/semi synthetic/fully synthetic, so a 0W20 doesn’t cost less than a 10W40 very bad comeback Perodua. Salute to all Paultan’s team for providing a details article this time. You really dig deeper. 2 main aspects that every drivers need to consider for long run has been explain here. Good job. Now everyone will think back twice by themself before purchase among these 2 brands. They also can consider another brands if they like. Continue giving us a best articles to read. normal service should be under RM180. Dont trust those ‘commission greedy’ SA(s). Things like injector cleaner, headlamp cleaner & other are just optional accessories in service that gave those SA sales commission in the end of the month. For ATF(for AT its called automatic transmission fluid not oil), should replace during major svc at 40 & 80k, the 20k is only for severe driving condition. Next time, be cautious before signed the paper, save money by tell them you wanted normal svc with only M.oil, O.filter & Gasket. Weh every dealership also same laa whatever brand. I agreed with Datuk Zahari Husin’s statement it should apple with apple. Easy said, Bezza vs Saga, while Persona vs Myvi. If not, I can say Persona standard like Bezza, and how bout Saga, standard like Axia ka? If in previous article compared the Aruz’s sales with X70, it’s also not apple with apple. Aruz should compare with X50 ( which will arrive soon maybe) and Honda BRV. To compare with X70, Perodua need to rebadged RAV4. Dont see the bigger picture eh? Proton used a vehicle from a class higher than Perodua yet the cost is cheaper. No doubt Perodua has the better overall vehicle but to me its nothing more than an overpriced rebadged vehicle. Below is copy and paste from my comment on previous article. 1) Both company claimed their fuel consumption is 6.1L/100km (for Persona) and 4.5L/100km (for Bezza). The different is 1.6L/100km. Assuming both users travel 10,000km per year. For 5 years (50,000km) the fuel different is 50,000/100 X 1.6L = 800L. Times with current fuel rate of RM 2.08/ltr, Bezza consume RM 1,664 less than Persona. If both users travel 20,000km per year, follow the standard maximum mileage for every 6 mths, for 5 years Bezza consume RM 3,328 less than Persona. Perodua Bezza servicing costs: should be compared to Proton Saga than the Proton Persona. Then only its no discrimination Icerd. Can proton also publish the depreciation cost comparison after 2 to 3 years. this will be the bulk of the running cost as well. depreciation cost is not running cost. if you own the car for 10 years, which most malaysians do, who cares how much the car depreciates? Nothing doing about the fuel consumption. Perodua always lies on their FC, you can never ever reach even near those figures they quote. Well, as P2 salespipu say tak payah pikir, so of course most owners will say yes to everything. Which makes the majority will unknowingly pay the 40% higher prices compared to the average Persona2 owner. No coincidence too that many fresh grads become bankraps and almost all of them owns a P2. They cant afford to maintain the car and this is the reason why. Its so clear now. So there u have it, conclusive and irrefutable proof that P2 cost of ownership is 40% higher. Tenkiu PT writers for making this loud and clear! What’s even more astonishing is the fact that the Bezza needs 0w oil and Iridium plugs! As a ex Proton owner, I must confess that Proton cars are not build to last. Every servicing is a pain in the arse and took up so much of my time. When you drive proton car the 1st 6 months felt new. After 1 year the car feels like its already 3 years old. The NVH is so bad. You own the car for 3 years it felt like its been on the road for 7 years. It just felt like the car isnt made solidly and build to last like Perodua. The myvi on the other hand is 10 years old, but the same mileage you feel like its only 2-3 years old. BS! Im a Proton owner for 2 years now and mileage almost 40k, so far there’s no hint that the car aging like you said, and your 10 years myvi felt like 2-3 years, what a BS! lel. 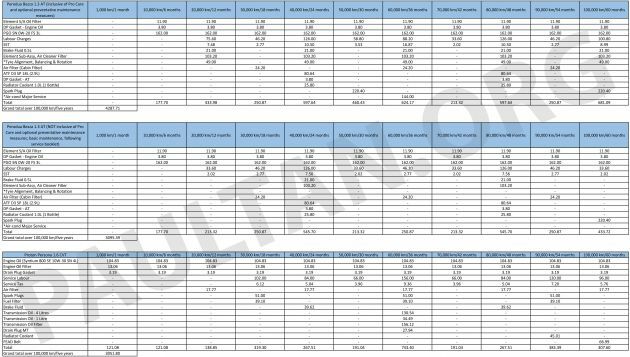 Can perodua inhouse calculations be trusted? We can’t even trust their FC results wei! I own a perodua and proton, both servicing costs are the same. I told you already… the moment i see the figures, i knew Proton is hiding something and mentioned that they use cheap engine oils. i got thumbs down for that. after you read this ” It was also pointed out that the Bezza uses 0W-20 motor oil (Persona uses 10W-30) and iridium spark plugs, which are costlier than regular items”, what i say is true. Since when lower oil viscosity equals to better oil quality? Your Honda standard recommended oil is also semi-syn only. What kind of battery are Perodua cars with start-stop function is using, like this Bezza and the new Myvi? Is the Myvi still using NS40 or AGM? Those with ecoIdle(start stop) uses M42 battery. You may use NS40, but ECU wont recognize the battery charge, thus ecoIdle will not function. The irony is if you wanted the M42 to last longer as it is pricey(above RM300, I suppose), switch off it or shift N after every stop in traffic jam. Rm823 just for the brake fluid, spark plugs and air filter? Don’t you think that is a little steep? wah! 0nly 1% differnce. not so low cost la in the end. might as wel get Persona, same cost, but more power, better handling. Total 3years Rm 304..ofcoz with coupon and free labor.. Please please please have a look at the items before you say yes to the SC.. they do not tell you that some items can be taken out i.e. just an extra unnecessary things intentionally to rip your wallet..
perodua still longlasting compare to proton even some said perodua lousy…perodua technology is still under toyota and daihatsu. 1.Proton persona car after 2 years the ekzos pipe give whistling and lossing sound. Very annoying. However proton warranty department said no warranty and need Rm400 for changing ekzos. 2.Another problem is the servicing schedule of proton persona not including timing belt on 80000 km service which is extra Rm1000 for customer. Is not shown in the listing. It violate the non disclosure act. 3. Besides, after 2 years, the car front desk compartment always got mouse squeezing noise which is very annoying. This is proton standard. No warranty after one year. 4.when starting car in the morning, air conditioning compressor humming sound is also normal as customer service told me. This happen even the car was newly collected. Think twice before action. Proton standard still remain….??? ?